A true hedonism has been present on the island ever since the time of sumptuous Roman villas, springing from the walls or Renaissance summer houses and, despite all the challenges of island life, it slips even today into the reveries of modern nomads who enjoy the splendour of Hvar where, almost 150 years ago, the organised European tourism began. Discovering the layers of history which permeated the island with culture and heritage resembles a perpetual treasure hunt. Twenty-four centuries of urban life left a trace in stone, island monuments and buildings, but also in all fields of art and everyday life. Such thread can be traced back from contemporary artistic expression through the fertile age of Renaissance which, at its peak, gave rise to the oldest public theatre in Europe, to the heritage left from the Age of Antiquity. The mystical beauty of island churches and the priceless value of their works of art, the monumentality of centuries-old dry stone walls and dry stone piles, the secrets of Illyrian debris and the stories of narrow stone alleys, form only a part of the rich repository of island culture. St. Stephen’s square/ Piazza, 15th cent. 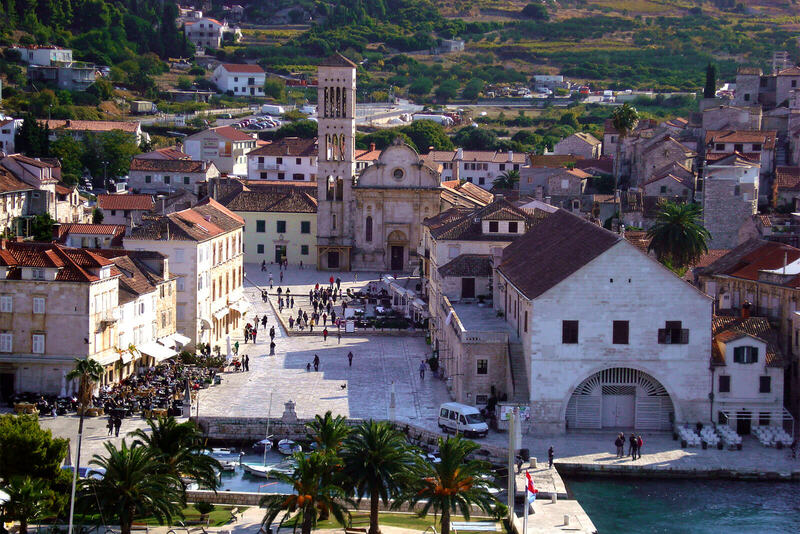 Central square in the city of Hvar or Piazza is the largest square in Dalmatia. Originally it was a deep bay which was filled with rocks for centuries until it got its present dimensions. Subsequently it was a space between two fortified cities: Groda in the north and Burg in the south. By the 15th cent. Piazza was formed with the cathedral in the east and sea in the west. It used to be wider than it is presently but due to shortage of space in the fortified city, houses were built on the northern part of Piazza in front of the city walls. Communal well in the center of the Piazza dates from 1529. Piazza was fully paved in 1780. Hanibal Lucić’s Summer Residence, 16th cent. 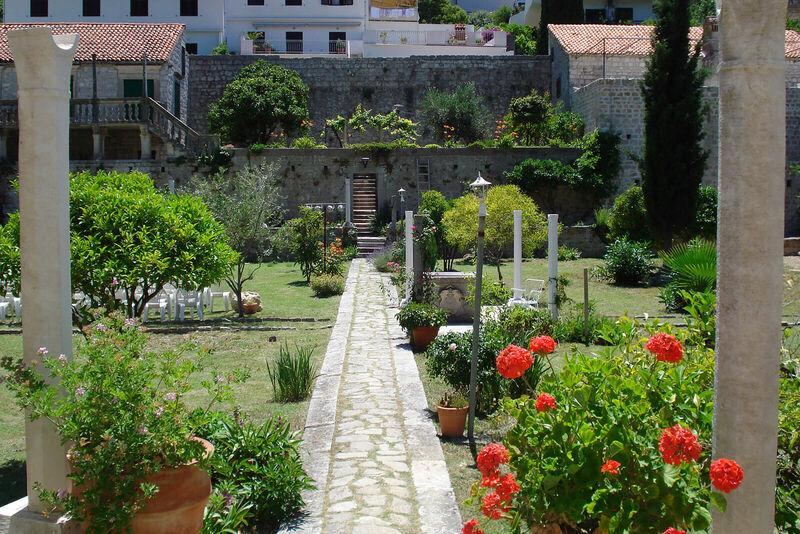 Summerhouse of Hanibal Lucić is the most famous example of a suburban summerhouse in the city of Hvar. 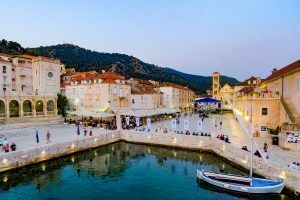 It is located near the old road which connected Hvar and Stari Grad since ancient times. It was built in the middle of the 16th cent. Two houses and a spacious garden in the Renaissance style make this enclosed property. The building on the east side was used as a countryside residence of the owner and the one on the west side was used for economic purposes. 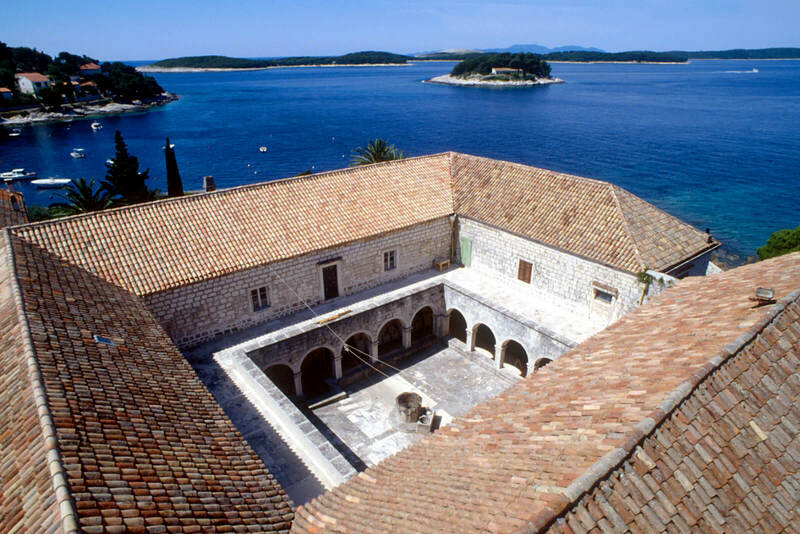 The Hvar Heritage Museum is located in the summerhouse. Benedictine Nunnery and Church of St. Anthony the Abbot, 17th-18th cent. The Benedictine Convent has been located here since 1664, originally in the residential complex of the poet Hanibal Lucić’s family (1485 -1553), which was left by his daughter-in-law Julija in her will to the Benedictines in 1591. Next to the convent is the Baroque church of St. Anthony the Abbot and John the Baptist from the 17th cent. and the convent collection of arts and lace made of agave threads which nuns have been making from the 19th cent. and which is inscribed in the UNESCO’s List of the Intangible Cultural Heritage of Humanity. City Fortress/ Fortica 16th cent. 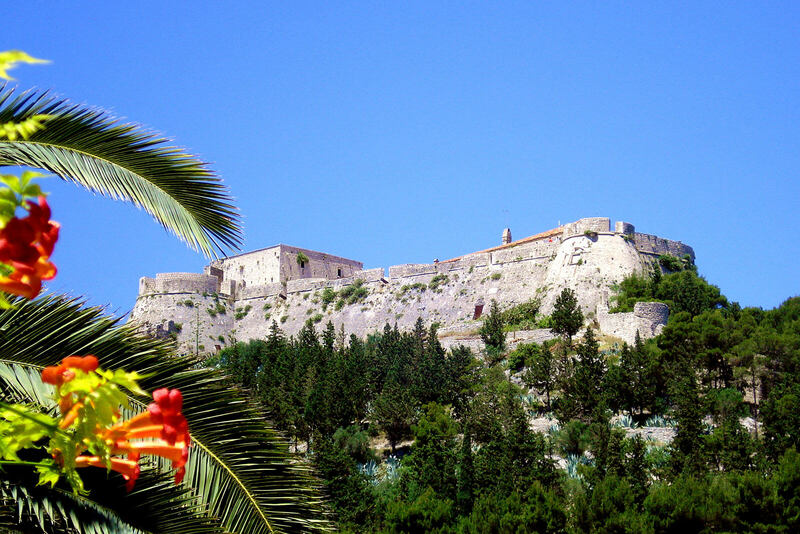 Building of the City Fortress started after 1278 when Hvar came under the Venetian rule. Fortress with the city walls represents a unique defensive system. In 1551 a new fortress was built at the place of the old one and it offered protection to population who had taken refuge there during the Turkish invasion in 1571. Explosion of gunpowder depot caused by thunder considerably damaged the fortress in 1579. 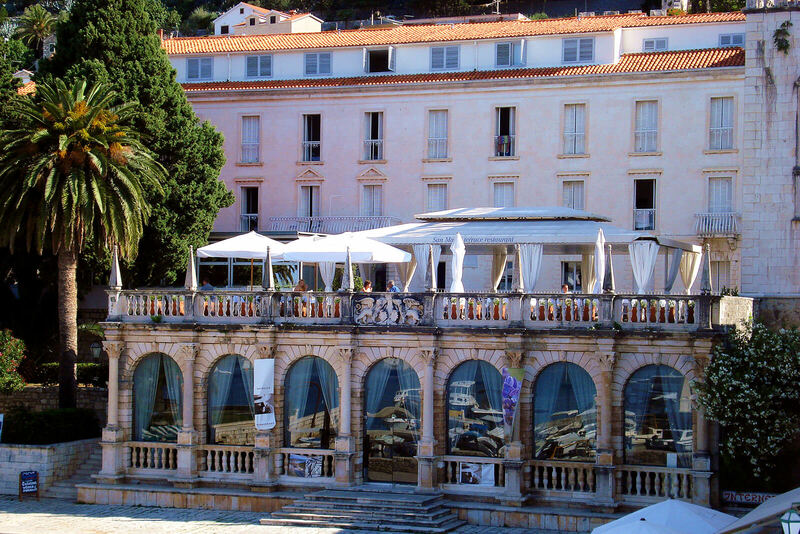 It was repaired during the Duke Pietro Semitecolo’s time at the beginning of the 17th cent. by building the Baroque defensive bastions. The last army barracks were built in 1775/1776 during the reign of Maria Theresa. Collection of amphorae is located in the fortress. City Lodge, 15th – 16th cent. 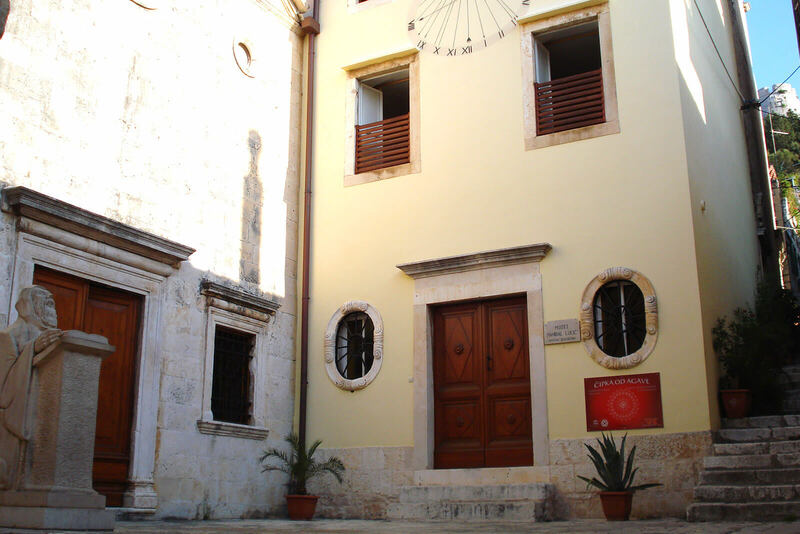 City Lodge of Hvar was first mentioned in 1289. Building of a new lodge started in the 15th cent. and it was completed in the 16th cent. It burnt down during the Turkish invasion in 1571 but it was fixed and renovated later on. The lodge got the final appearance of the facade at the beginning of the 17th cent. During the Venetian rule the lodge was used as a public courthouse. Public auctions for lease of the taxes and customs duties were also held there. Adjacent Duke’s Palace was pulled down at the beginning of the 20th cent, due to construction of the Empress Elisabeth’s hotel. Kursalon (hotel’s cafe) was in the lodge at the time, as well as the reading room, ballroom and meeting place of the local social elite. St. Stephen’s Cathedral, Pope and Marty / Velo crikva 15th – 18th cent. Cathedral of St. Stephen I, pope and martyr was built at the place of the Benedictine convent of St. Mary of Lesna. It became the cathedral in the 13th cent. 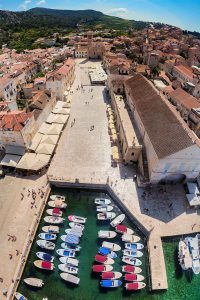 when the seat of diocese was moved from Stari Grad to Hvar. New cathedral was built from the 16th until 18th cent. The building is a triple-naved type of basilica with a square shrine and Renaissance choir stalls. The cathedral has late Renaissance trefoil facade which symbolizes the Holy Trinity. The bell tower on the north was completed in 1549/1550. Inventory comprises interesting altars and pulpits from the Gothic period. Paintings by the Venetian masters are on the altars. 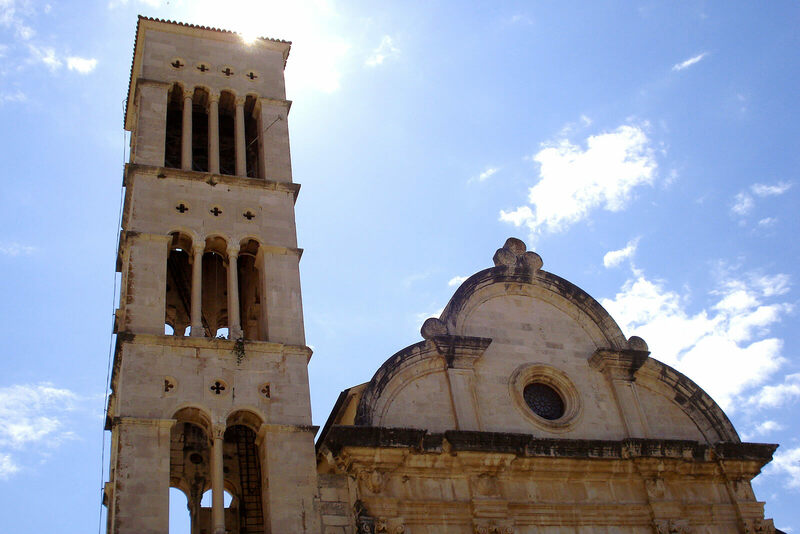 Franciscan Monastery and St. Mary of Grace Church, 15th-16th cent. Church of St. Mary was built in the 15th cent. as a single-naved Gothic building, at the place of the earlier chapel of the Holy Cross. Inside the lunette of the main portal is a sculpture of the Madonna with a child, the work of Niccolo di Giovanni Fiorentino, set up in 1465-1471. Northern nave of the church with the Renaissance chapel of the Holy Cross was built in 1536. Inside the church we can see the 16th cent. altars, choir with Renaissance crucifix, Venetian work from the 16th cent., and the grave of the local poet Hanibal Lucić. Matteo Ponzoni’s painting “Last Supper” is in the refectory. Library and museum collection are also in the monastery. Arsenal & The Historic Theatre, 14th -17th cent. The first Arsenal was built between 1292 and 1331 and it was used as a shipyard for galleys. New Arsenal was built at the same place in the 16th cent. but shortly after it was burnt down by the Turks in 1571. During Duke Pietro Semitecolo’s time, in 1611 Arsenal was renovated and expanded when it got its present look. Fontik – grain warehouse was built in 1612 along the northern front of the Arsenal and also a big terrace above it, called Belvedere, from which the theatre, founded the same year, was entered. It was the first public theatre in Europe. Hvar historical Theatre is located on the second floor of the Arsenal building. On the lintel over the entrance door of the theatre there is an inscription: ANNO SECVNDO PACIS MDCXII. The year 1612, as the inscription says, was the second year of peace between the confronted sides of the Hvar commune. 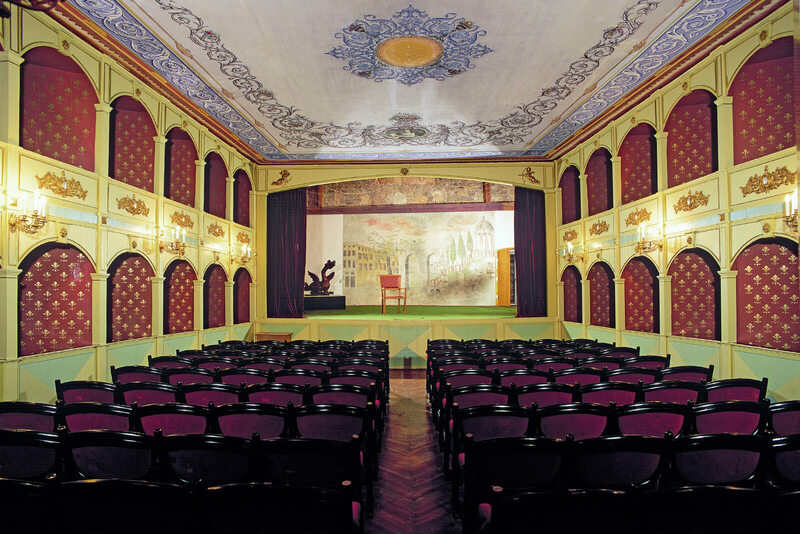 Auditorium with boxes is dated to the year 1803 when the Theatre Society was founded. Present nee-Baroque appearance dates back to the middle of the 19th cent. Two wall scenographies were preserved, fresco from 1819 is still at the back wall of the stage. Fresco from approximately 1900 depicting Duke’s Palace was restored and set on large movable boards.